I'm not ill very often so when do get ill I do it properly. It all started on Boxing Day when I felt a little tickle in the back of my throat. The next day it was a bit of a "grumble" in my chest. It began proper the day after that. It kicked in hard. This was proper flu (in my opinion). It meant that my festive celebrations were a little clipped. I had some time off work for the first time in ages. 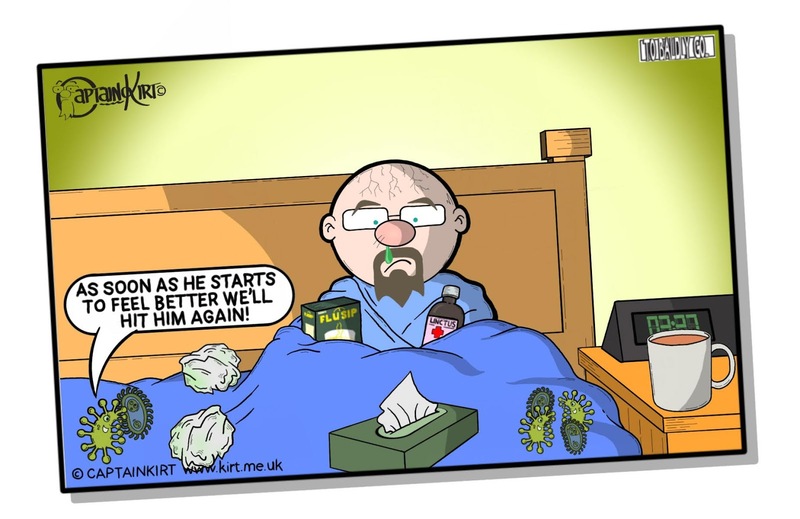 I returned to work in the New Year and thought my recovery was in hand until a couple of days later when the coughing started. Then I couldn't sleep at night, it was hard to breath and I felt worse than ever. I couldn't even go of sick because it would be a 'second instance' and would bugger up my sickness record. So I'm trying to take it easy the best I can. I had to pack in riding my bike for a while since it was making me worse. I've been resting when I get the opportunity and trying to take it steady when can't. I hope that it'Il just go when it's gone through it's process. I hate being ill, hate feeling like this. I wanted to start 2019 off properly. I guess I'll have to wait to kick off this 'new' year.